With its long flat camera platform and V-lock quick-release compatibility, SHAPE's BP8000 V-Lock Quick Release Baseplate Kit is a versatile rig option for mid-sized cinema cameras with flat bases. The centerpiece of the kit is the V-lock baseplate. Several inches of adjustment is available for achieving balance with large or small lenses. Adjustable 15mm rods in the front and rear allow for different cameras to comply with the 15mm LWS standard for compatibility with follow focuses, lens supports, and more. If you're not carrying the camera on your shoulder, the entire rig can be locked into the included VCT-14 tripod plate. The included articulated handles adjust quickly, with the push of a button. Length adjustment is provided by way of a thumbscrew. Rosettes on either side of the baseplate secure the handles. See below for more details on the items included in this kit. The baseplate includes a removable shoulder pad and features rosette adapters for SHAPE and ARRI standard handles. It has 1/4"-20 and 3/8"-16 tripod mount threads and a V-lock delta adapter for attaching to the Sony VCT-14 or Panasonic SHAN-TM700 tripod adapter. The shoulder pad secures on by touch fasteners. The tripod mount threads are located underneath the shoulder pad. 8" and 4" 15mm rods are included for the front and back. 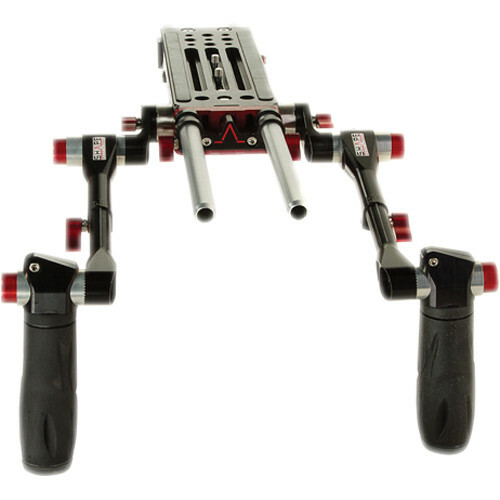 The baseplate features three camera mount slots, all supporting 1/4"-20 and 3/8"-16 screws. The off-center slots allow you to mount your camera offset if you use a 15mm Studio Adapter. 1/4"-20 and 3/8"-16 mounting threads are peppered behind the three slots for attaching articulating arms and other accessories. Two 1/4"-20 and two 3/8"-16 camera mount screws are included. This baseplate is best used with cameras that use external viewfinders. The black and red Telescopic Handles with ARRI Rosettes from SHAPE are left and right handgrips that can be attached to cameras and camera support hardware that has standard ARRI rosettes. Each arm features three points of articulation, combined with the approximately two inches of arm extension allows you to adjust the arms for your comfort. The arms attach to your camera or support via an ARRI compatible rosette with spring-loaded locking levers, which allow you to lock your arms in place without having a full 360° of rotation. Shape's unique push-button articulating joint provides additional articulation near the rosette, while a second push-button articulation joint allows you to rotate and precisely position the rubber handgrips. A second spring-loaded locking lever along the arms allows you to extend the arms up to two inches and rotate the handgrips throughout 360°. The arms are indexed for extension and rotation, so you can quickly move between known setups. The push-button locking joint enables independent rotation throughout 360°. Spring-loaded locking levers allow you to tighten or loosen the lever even when you do not have space to turn the lever throughout the entire 360° range. The arms feature two inches of extension and are indexed every 5mm of extension. The arms can rotate through 360° and feature 30° of index markings. This pair of Shape 15mm Aluminum Rods (8") connect into your camera rig, extend it, and let you add various Shape and third-party accessories compatible with 15mm rods. With these two rods and with a few fundamental accessories, you can most certainly even begin building your own rig from scratch. The rods are each 15mm in diameter, 8 inches long, hollow, non-threaded, and made of reliable aluminum coated with a clear finish. This pair of Shape 15mm Aluminum Rods (4") connect into your camera rig, extend it, and let you add various Shape and third-party accessories compatible with 15mm rods. With these two rods and with a few fundamental accessories, you can most certainly even begin building your own rig from scratch. The rods are each 15mm in diameter, 4 inches long, hollow, non-threaded, and made of reliable aluminum coated with a clear finish. This is a Panasonic Tripod Adapter Plate from SHAPE allowing quick-release mounting/dismounting of professional broadcast cameras. Attach the camera via the VCT-style V-Lock mechanism and then mount to a tripod quick release plate. Multiple 1/4"-20 and 3/8"-16 threaded holes are lined up along the length of the plate on the bottom, allowing for the best possible balance selection. Box Dimensions (LxWxH) 14.2 x 5.95 x 4.45"
Box Dimensions (LxWxH) 8.8 x 7.4 x 4.3"
Box Dimensions (LxWxH) 9.5 x 3.5 x 0.5"
Box Dimensions (LxWxH) 11.4 x 4.0 x 1.7"